From top to bottom: Our Liberty London navy mix is the perfect way to dress up any outfit. 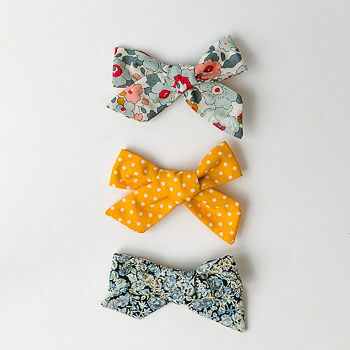 Next we have our yellow and white spotty bow that will brighten up any rainy day. Last our navy print is the most delicate design perfect for a princess. Our bow packs are delivered in a beautiful pink box, perfect for a princess. Free delivery. Gift message options are available at checkout.